X-ray Fluorescence Spectrometer is used to detect and analyze noble metals like Gold( Au), Silver(Ag), Platinum (Pt), Palladium (Pd), Rhodium (Rh), Ruthenium(Ru), Copper (Cu), Zinc(Zn), Nickel (Ni), Cadmium( Cd), Indium (In) in the Jewellery Industry. Traditional Gold purity testing methods such as fire assay and chemical analysis are time consuming, cumbersome and destructive. XRF testing is relatively simple, fast, reliable, inexpensive, no sample preparation required and most of all is non – destructive. Energy Dispersive X-ray Fluorescence Spectrometer is used to detect and analyze noble metals like Gold( Au), Silver(Ag), Platinum (Pt), Palladium (Pd), Rhodium (Rh), Ruthenium(Ru), Copper (Cu), Zinc(Zn), Nickel (Ni), Cadmium( Cd), Indium (In) in the Jewellery Industry. Energy Dispersive X-ray Fluorescence (EDXRF) technique relies on the detector and the detection circuit capability to resolve spectral peaks due to different energy X-Rays emitted when a primary X-Ray beam strikes a metal alloy corresponding to different elements in the sample, intensity of the spectrum radiation proportional to the concentration of element. The spectrum then processed through the powerful computer software which calculates and reports the various elements & their composition in the sample. 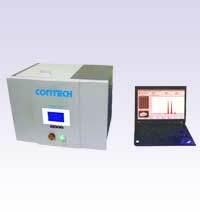 XRF Gold Purity Tester consists of X-Ray tube, high voltage power supply for X-Ray source, X-Ray tube filters, gas proportional counter detector, processing electronics and system interface & an external computer. A camera is incorporated in the system to view the sample on the computer screen. XRF is a reference technique, hence standards are required for quantitative results. Standards are analyzed, spectral intensities generated are used to obtain a intensity v/s concentration plot for calibration. 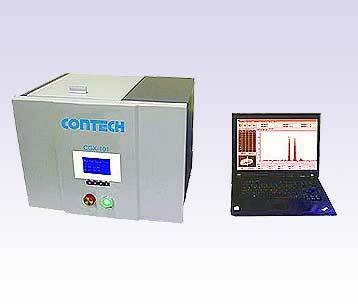 This calibration is used to evaluate the spectral intensities of unknown samples. Detectable elements : Gold( Au), Silver(Ag), Platinum (Pt), Palladium (Pd), Rhodium (Rh), Ruthenium(Ru), Copper (Cu), Zinc(Zn), Nickel (Ni), Cadmium( Cd), Indium (In). Sensor : Gas Proportional Counter Detector. Operation atmosphere : Vibration free surface and air conditioned room. Interface for Computer : Inbuilt, External Computer required. Software for Operation : Menu Driven User Friendly Operating System. Height : 335mm (with test compartment cover in closed position) & 585mm (in open position).